The Midessa Oil Patch RV Park, Odessa, Texas definitely receives the Spud and Joan seal of approval. It is very quiet. One had to be awake to hear anything, there was no noise to wake one. We heard a train off in the distance. Trains used to blow two longs, a short and another long on their whistle or horn for a road crossing. I think this was called the 12L signal and it was the letter Q in Morse code. Dah, dah, dit, dah. The engine was crossing the road on the last dah. This train last night simply blew blasts. They were neither short nor long. It appears that now Morse is gone the railroad has eliminated it completely as well. We met several of these trains today. The container trains carry two containers on each car. They must be a couple of miles long. The major container companies, Maersk, Hapag-Lloyd, Evergreen, and so on are represented. Each container train has two engines forward and one pusher on the stern. The regular freight trains are just as long but they have three engines on the front and none on the stern. We were up at 0700 with a number of e-mails to entertain us. We got around and managed to get on the road at 0905. That was pretty good for us. We crossed the Mountain Standard Time Zone so we are now three hours behind Nova Scotia the same as Alberta. We drove for over four hours and pulled into a truck stop at Fabens, Texas, at 1241 Mountain Time. Oh the dust. You could not tell the colour of my moccasins from walking around the yard. We parked way at the back of the 18-wheelers and I went looking for the pickup diesel pump. The girls were all Mexican and most could hardly speak English, but I left my credit card and pulled the truck up behind an 18-wheeler to the pickup pump. The girl turned the pump on and we filled the tank. I had a chat with the Texan filling his Kenworth in the next pump. He was from Mission, Texas, and heading east for home. 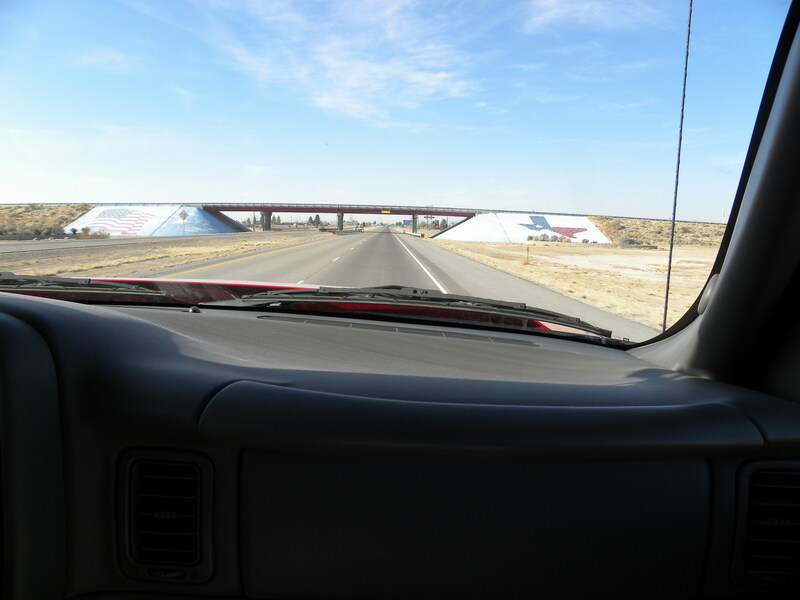 It was a good drive on the I-20 and continued a good drive into the I-10. We set the cruise on 60 MPH and enjoyed the ride. 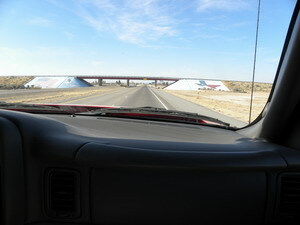 The speed limit was 80 MPH with trucks at 70 MPH. 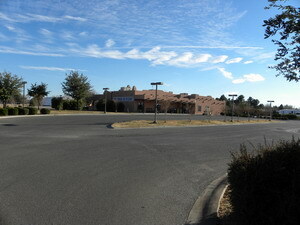 It was four lane all the way and eight to twelve lanes around El Paso. 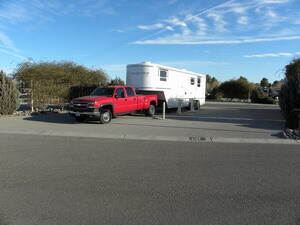 We planned to stop at El Paso for the day but all the campgrounds require reservations so we continued on. 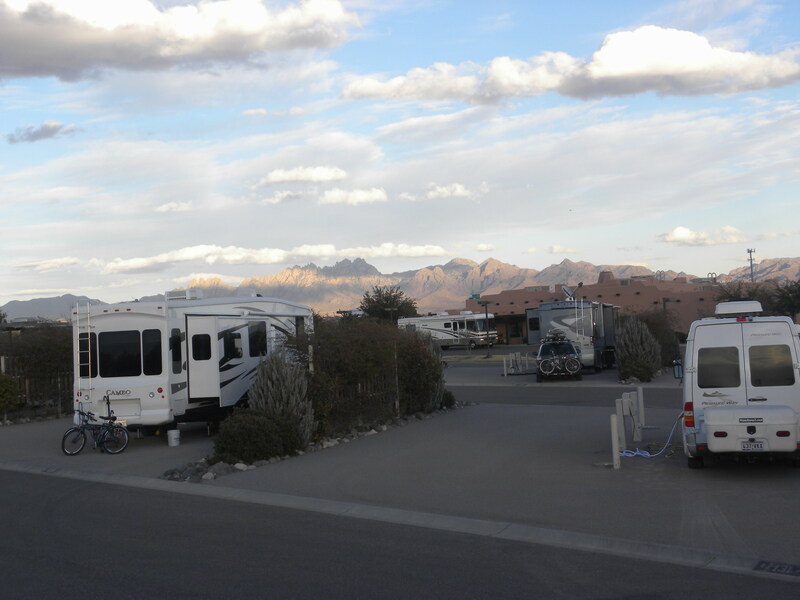 It was another 72 miles only to Las Cruces, New Mexico, where we pulled into the Hacienda RV Resort. We are glad we did. 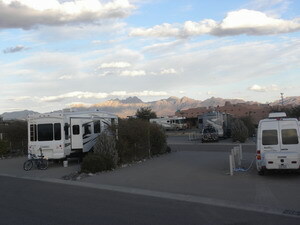 This is the nicest RV Park we have been in so far. The temperature was cold this morning. That wind was raw and I had to put on one of my insulated shirts to get un-hooked, tanks drained and on the road. The sun was hot in the truck and we put the air conditioning on but the temperature did not go very high. It was 68F when we arrived at Fabens, Texas, but had dropped to 66F when we left a half hour later. It was only 65F when we pulled into Hacienda. It was not a bad day. We made 555 kilometers and that was plenty. Odessa was part of the oil field as we suspected. 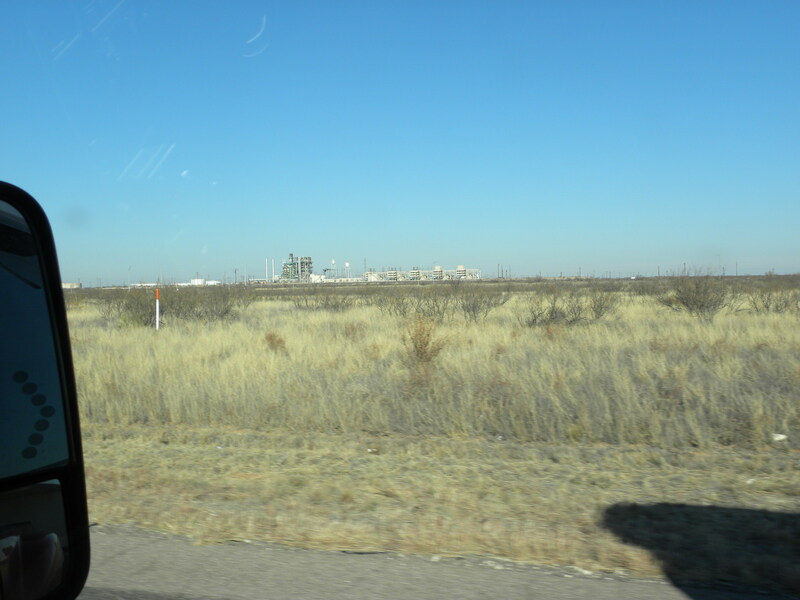 The Permian Basin is located in West Texas and the adjoining area of Southeastern New Mexico. 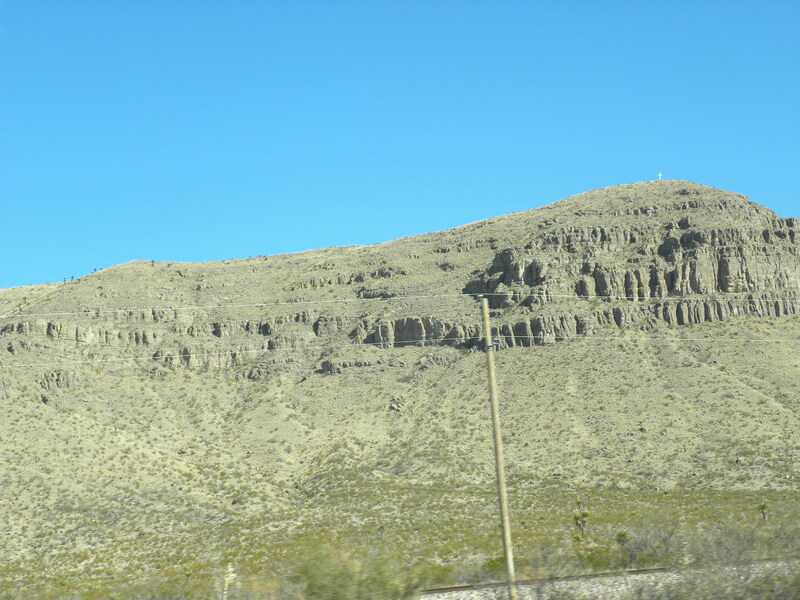 It underlies an area approximately 250 miles wide and 300 miles long including 17 Texas counties. 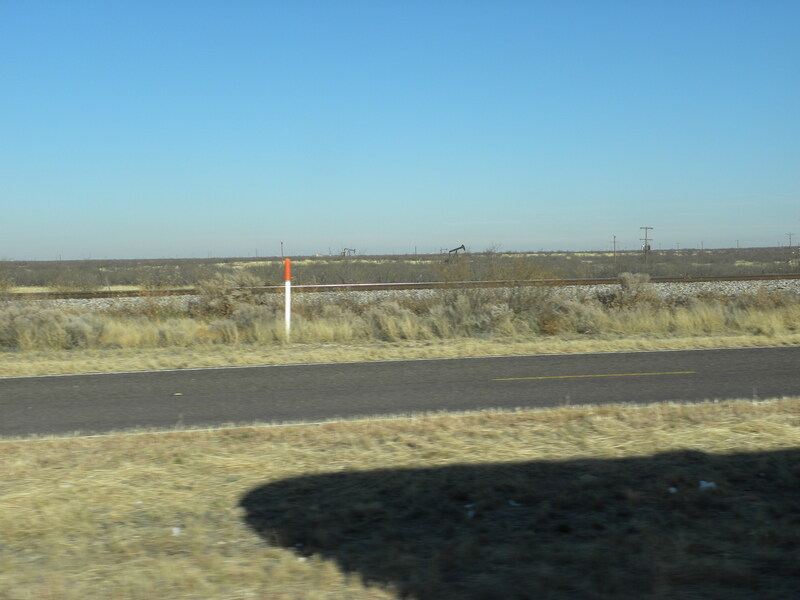 Driving west from Odessa today reminded us of the cartoon of the old Texas Oil Millionaire with the long limousine with the Long Horn horns on the front. The guy driving it had a motorcycle to ride back to the back door and let the old millionaire out. You must have seen it at one time or another because we are sure it was made in the 1950's. This was the country that made that old boy and others like him. Those at Midessa RV Park were mostly oil field workers. There were three men living in a tent trailer just behind us. We saw few women in the park. There were mostly pickups parked at each unit. Joan had a hard time trying to get some good photos today. We have deleted quite a few. Joan was trying to get a good shot of the oil field pumps pecking away and this is about the best. This oil refinery was out in the boon docks just before Fabens, Texas, where we stopped for diesel. This was rather neat but the photo does not do it justice. The banks under the overpass were painted stones. They had the United States flag on the left and a Texas design on the right. An outline of the state in red white and blue with the lone star. Texas is the Lone Star State. These are some Black Angus cattle trying to scrape up a dinner with the slim pickings at their disposal. It has been months since they had rain around here. All the creeks were dry and very dusty. 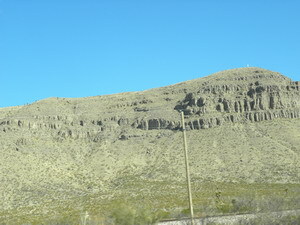 This is a hill just before we went through El Paso. Note the cross on top of the hill and the reason Joan took the photo. 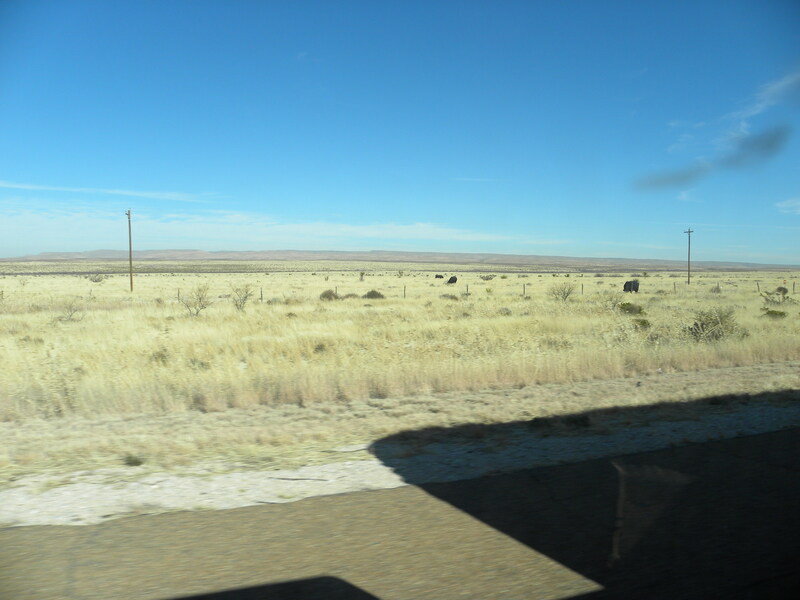 When we crossed into New Mexico there was an awful stench. We soon learned the sources. There were thousands of cattle in pens for several miles. The majority appeared to be Black Angus so they must be able to scrounge up a meal in those dead looking fields. They were probably waiting for their turn in the slaughter house. This is the Hacienda RV Resort Office on the left at Las Cruces, New Mexico. This is our rig on site 121 at Hacienda. Site 122 is the blank spot between our rig and the row of trees. This place was definitely designed and did not just grow. If and when a rig comes into 122 it will drive in from the opposite side that we did putting their hook-ups next to ours. In other words our doors will not be together but on the opposite sides of our rigs. There are any number of RV repair centres right here and I hope to get a water filter for ours. That is something I should have had long ago. This is the view out our back living room window taken at 4:30 PM Mountain Standard Time. This was more or less our day. This park is dog friendly for sure. There are a bunch of them camped here. One rig has two yappy little dogs you can hear all over the park.